Roman warriors needed weapons that showed off both their superior fighting skills and their rank. The Embellished Gladius Set is a duo of fantasy gladius for high ranking Roman warriors to wear and wield as a part of their look. These double edged swords are made from stainless steel, complete with a sleek satin finish. The wasp waist style of these swords are indicative of the classic Mainz Gladius shape, which was a popular choice among the Romans. 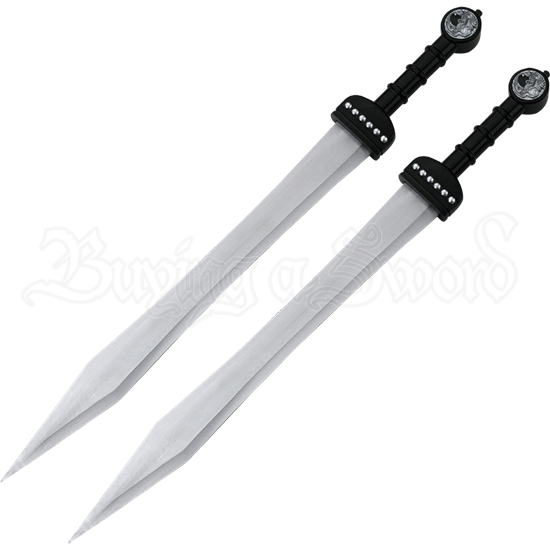 The black handles are featured with silver studs across the guard, with grips along the hilt and silver designs on the wheel pommel. With two protective nylon sheaths that include straps for easy carrying, the Embellished Gladius Set is a modern twist on a classic Roman sword for anyone wanting to celebrate the centurions of the ancient world.